This black and white water color on paper was created by Lauretta Louise Fox Fisk, wife of Washburn College sociology professor Dr. D.M. 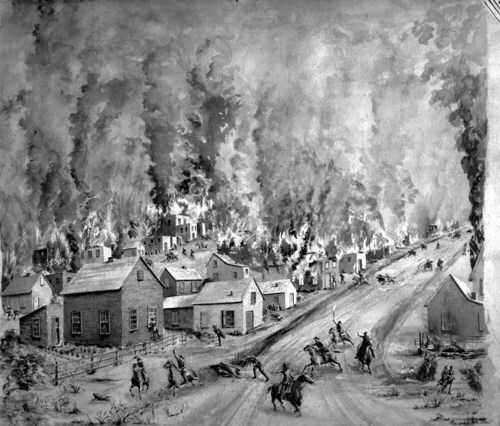 Fisk, shows Quantrill's raid on Lawrence, Kansas, August 21, 1863. Confederate guerilla forces led by William Clarke Quantrill, 1837-1865, attacked Lawrence, Kansas, killing nearly 200 people and burning most of the town.